Scott Bigham went into his pro career without any great expectations, he told The Spokane Spokesman-Review in August 1988. "I said I'd take it day by day, have as much fun as possible and give 100 percent to it," Bigham told The Spokesman-Review. "That way, when my baseball career's over, I can look in the mirror and say I tried as hard as I could." Bigham had much fun that first year for Spokane. He hit .334 over 76 games and knocked in 38. Bigham tried hard from there, but he couldn't match those first-season stats. He played two more seasons. He never made AA. 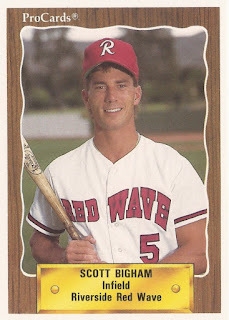 Bigham's career began that year in 1988, taken by the Padres in the 22nd round of the draft out of Willamette University in Oregon. Bigham started with the Padres at Spokane and he started hot. That start continued in mid-July, according to The Spokane Chronicle. "When I signed, I sure wouldn't say after 26, 27 games I'd be hitting over .380," Bigham told The Chronicle. "I'm just ecstatic being here, basically." In late August, Bigham played with a broken finger and went 4 for 5, scoring the winning run in a game. Overall, Bigham knocked 105 hits in 314 at bats in 1988. Bigham moved to single-A Riverside in 1989. He hit .251 over a full season there. He had 33 RBI and 17 stolen bases. He returned to Riverside for 1990. He hit .244 that year, with 37 RBI. It was his final season as a pro.